The Vice-Chancellor, Professor Kolawole Salako has called for an increase in research partnership and collaboration among scientists as a means to promoting research development and increasing global competitiveness. Professor Salako made this call while delivering his Address at the Research Collaboration Symposium between the Federal University of Agriculture, Abeokuta (FUNAAB) and the Alexander Von Humboldt Foundation (AvH), Germany, titled, “Enhancing Scientific Cooperation between Germany and the World”. According to him, research partnership and collaboration among scientists are essential components of the developmental goals in the University system and FUNAAB has remained in the forefront of research for development in sub-Saharan Africa. “Our researchers are contributing to scientific knowledge and addressing critical areas of needs in Africa for improved food supply and nutritional security”, he said. 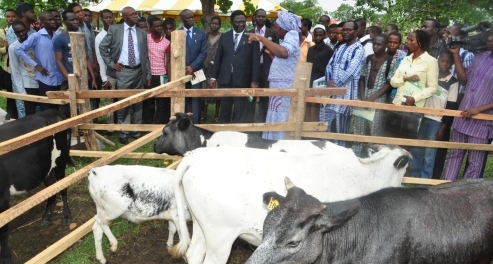 The Vice-Chancellor who was represented by the Deputy Vice-Chancellor Academic, Professor Morenike Dipeolu however noted that researchers’ best efforts to unleash the potentials of agriculture, transform the economy of Nigeria and bring wealth to the doorsteps of its citizens have remained a mirage in the Country as a result of limited resources and infrastructural deficiencies hence, the need for Nigerian Scientists to seek external collaboration. According to him, “Those who seek to be outstanding in their research cannot limit themselves to their immediate surroundings. They must have a global outlook while working locally”. Professor Salako added that “Researchers from Nigeria need to reach out to researchers from other countries to expand their frontiers of knowledge, improve the quality and impact potentials of their research and keep abreast of recent developments in their fields”. He lauded the AvH Foundation programme which several researchers of the University have benefitted from, assuring the AvH team that researchers in the University would continue to put into good use the knowledge harnessed for technological advancement and nation building. The Vice- Chancellor also charged Scientists and researchers to take advantage of the Symposium to improve their chances for successful application for research funding especially in Germany. In his Remark, the Deputy Secretary General of AvH, Dr Thomas Hesse stated that the Symposium aims at promoting academic cooperation between excellent scientists and scholars from abroad including Germany. According to him, the Research Fellowships of the AvH allows awardees to go to Germany and work on a research project chosen by the AWARD recipient together with a host in Germany. The Deputy Secretary General stated that there are no quotas for countries or academic disciplines, adding that the fellowship has been tailored to meet the need of every researcher either as postgraduate researchers at the beginning of their academic career, experienced academics or as a world authority in a discipline. Dr Hesse thanked the University Management during a Courtesy Call before the Symposium for the warm reception saying they were pleased to be in the University which has nine Humoldtians, as a result placing FUNAAB in the 5th position of Universities in Nigerian with their Alumni and the youngest University with fast growing number of Humoldtians. Corroborating him, Dr. Daniela Kneissl, Head of Division Africa and Middle East, Sponsorship and Network Department, AvH, disclosed that as an intermediary organisation for German Foreign Cultural and Educational Policy, AvH promotes international cultural dialogue and academic exchange, adding that to become a Humoldtian, only excellent performance counts.